Days away from retirement, Marangoni remembers his time spent supporting a blossoming young Slovak talent, Peter Sagan. LEDONG, China (VN) — Italian Alan Marangoni is retiring with fond memories of his time helping Peter Sagan become a star. Marangoni, 34, raced 10 years in the professional ranks with Team Liquigas and now Nippo Vini Fantini. With Italian super-team Liquigas, he prepared Sagan’s launch. Now, he is wrapping up his career with this final stage race at the 2018 Tour of Hainan. China’s warm resort island allows plenty of time for reflection. “I remember the years with Peter Sagan, team Liquigas, the four years with the team group was the best of my life because I did cycling at the best level with the great team of friends and worked for super good riders Peter Sagan, [Vincenzo] Nibali, [Ivan] Basso,” Marangoni told VeloNews. “For me, it was something special. I’m a normal rider, I did a good job, but I don’t have the talent to win big races, so I gave all I had for these riders, and it was a big pleasure. “The best day of my cycling life was the  Tour de France stage from Montpellier to Albi because we pulled 120km full-gas at the front and we dropped Cavendish, Kittel, and Greipel and we went straight to the finish line and Peter [Sagan] won the stage. It was Sagan’s fourth Tour de France win. He now counts 11 and six points classification victories. Marangoni turned professional in 2009 and raced from 2011 through 2014 with Italian team Liquigas. In 2015, the Cannondale sponsor linked with Garmin-Slipstream in the U.S. and since then, Italy has lacked a WorldTour team. He followed Cannondale to the American team because he had one year left in his contract, Sagan took another path with Bjarne Riis and Oleg Tinkov at Team Saxo Bank. Sagan won the world title three consecutive times. He remains attached to Italy. It is where he became a professional cyclist and the language is his second after Slovakian. 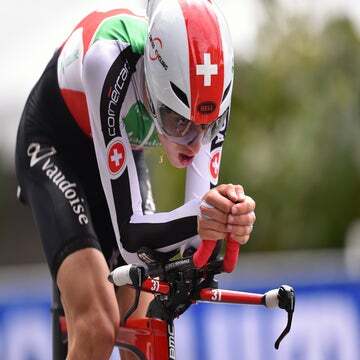 “I hope for Peter that he’s going to choose to do the Giro d’Italia. He’s never done it. For a champion like him, I think it’s necessary for his career to complete everything. Next year, I hope he’s going to do it,” Marangoni explained. Marangoni rides 181.9 kilometers to finish the Tour of Hainan on Wednesday. In the middle of November, he competes in his final event, the one-day Tour of Okinawa. “I’m happy because my effort is almost finished, almost done. It’s going to be my last stage race of my life,” Marangoni said. “I’m happy to finish my career in this place. It has been a good experience in Hainan, a really nice place, also a good place to holiday because we saw a lot of nice beaches and the sea, and also the hotels are very good. Next, Marangoni will work in television, but could not yet reveal his new employer.